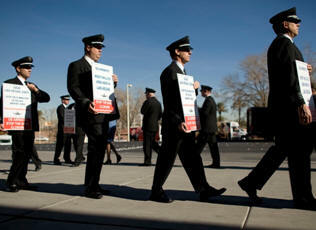 January 19, 2011 - The US Airline Pilots Association (USAPA), representing the pilots of US Airways, picketed on Tuesday at the Charlotte Douglas International Airport to bring attention to what it sees as US Airways’ deliberate efforts to drag out contract negotiations and keep concessionary labor contracts in place long past their intended duration. Since September 11, 2001, US Airways has twice filed for bankruptcy. After its first bankruptcy filing in 2002, the US Airways pilots' pension plan was terminated to help the airline cut costs. The airline subsequently emerged from bankruptcy in 2003. US Airways again filed for bankruptcy in 2004, emerging after its merger with America West Airlines was approved in September 2005. "From the pilots’ perspective, the carrier has been operating as two separate airlines since the merger," explained USAPA President Mike Cleary. "East US Airways pilots continue to work under a bankruptcy-era contract designed to help the Company survive, while our fellow pilots from the original America West Airlines continue to work under a contract negotiated under the strict covenants of the Air Transportation Stabilization Board (ATSB) loans. The ATSB loans have been repaid, and industry conditions have demonstratively improved since these agreements were negotiated." US Airways reported a third quarter 2010 net profit of $240 million, the highest third quarter net profit in its history. The company has also reported record traffic and leading metrics in on-time performance and customer satisfaction during the last few months. "As we now enter the sixth year since starting the merger process, the only obvious beneficiary of that transaction is Management," Cleary continued. "While they’ve busied themselves crafting lowball offers and delay tactics at the negotiating table, Management’s compensation has been at or near the industry’s best, in part due to bonuses tied to front-line employee performance. Meanwhile, our pilots languish at absolute rock-bottom wages and working conditions, even as US Airways earns record profits and the industry as a whole has recovered." In April 2009, after nearly three and a half years of negotiations, USAPA requested a National Mediation Board (NMB) facilitator to assist the parties in reaching an agreement, but US Airways rejected that proposal. In November 2009, USAPA again tried to facilitate the process by applying directly to the NMB for federally-mediated talks. The NMB granted that request in January 2010. While mediated contract negotiations are currently ongoing, USAPA still finds the progress to be excruciatingly slow and proposals from Management to border on insult. USAPA believes that US Airways is financially incentivized to drag out contract talks and lacks any motivation to conclude the negotiations. "Unfortunately, the Railway Labor Act (RLA) permits this type of uninspired negotiating behavior," added Cleary. "However, the RLA also permits job actions under specific circumstances. We intend to utilize every legally permissible means to compel this management team to finally cease this blatantly disrespectful treatment of our pilots." "It is important that the public realize that we have always tried to work with US Airways management to seek joint solutions, and we are committed to doing so in our contract negotiations," said Cleary. "However, our focus on mutually beneficial solutions is decidedly one-sided. We helped this airline when they needed it most. In return, we’re simply asking to be compensated like our peers, nothing more."